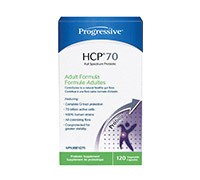 HCP®70 (Human Colonizing Probiotic, 70 Billion Cells) is a full spectrum probiotic supplement featuring 6 human strains that strategically implant healthy flora throughout the entire digestive tract. Consideration was also given to ensure oral and vaginal probiotic health. HCP®70 has also been cryoprotected and a family of stabilizing support nutrients has been added to help ensure the viability of the flora. It is also free of dairy and plant sourced strains that are transient in nature and fail to colonize within the GI tract. There are hundreds of billions of bacteria expanding over 400 different species within your intestinal tract; some are good, some are bad. Included in that number are Probiotics, the 'friendly' bacteria known to play a role in a host of bodily functions. These involve digestion, vitamin production and absorption, immune function, heart health, weight management and more. Serious health problems occur when the Probiotics become outnumbered by the unfriendly bacteria; a condition known as Dysbiosis. Symptoms include fatigue, bloating and flatulence, poor complexion, Irritable Bowel Syndrome, and food allergies, just to name a few. In fact, many health experts now feel that consuming a full spectrum probiotic supplement is as important as taking a multivitamin. We simply cannot live without these microscopic friends on the front lines of our intestines.